Planning a special trip with a private group and want a personalized itinerary? 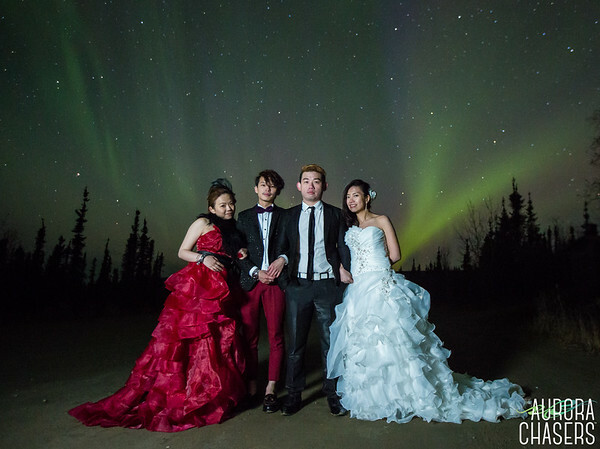 Maybe you're having a wedding under the Aurora and need the professionals to get you to the location and capture the magical moments for you? We've got you covered. Available any day during our season that we have no prior bookings in the schedule. Single evening trip. Pickup times and return times will be customized to fit the groups requested itinerary. Additional options may be included at an additional cost such as trip with photo instruction to the Ice Park or an adventure a bit further north of the normal locations. Includes: Transportation, Hot Beverages, Aurora Portraits, Photography Workshop and the flexibility to customize locations and times. Create your own private Aurora Chasing adventure. This is a custom option for those who want to enjoy the magic of the Northern Lights privately. You can choose a custom locations with unique views up to 100 miles outside of Fairbanks. You'll have exclusive access to Ronn and Marketa's instruction as they guide your private group and take you on the adventures that aren't possible with other tours. All Photography Workshop Tours include transportation to and from your Fairbanks accommodations, photography instruction and Aurora Portraits* and are single night trips. Learn to photograph the Northern Lights with true Professional Aurora Photographers. We'll demystify the secrets to predicting, finding and photographing the Aurora Borealis so that you go home with professional quality images of the Northern Lights*. 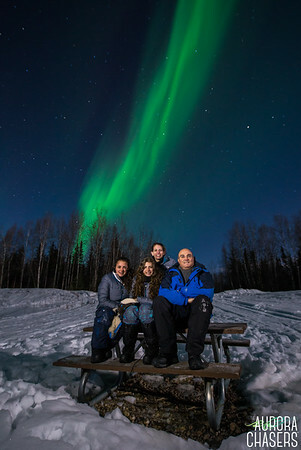 Bring your camera, a bit of patience and maybe an energy drink and we'll spend a night out under Alaska's magical night sky. We'll take you to one of our favorite locations to photograph "The Lights" and show you how to set up your gear to make stunning images of your own. We'll also make sure you go home with a few Aurora Portraits from your experience*. • If using a Nikon D3xxx or D5xxx model it's a great idea to bring a two-stage shutter release cable. This is optional for all other cameras but if you plan to use a shutter release, be sure it is the two-stage shutter button type. Due to the natural elements involved and the small personal nature of our company, we have a no cancellation policy except in the case of extremely severe weather which prohibits safe travel. If such an event occurs and we are not able to take you on your tour, you will get a full refund or the choice of another tour if available. We do not cancel for cloudy skies or lack of Aurora. Both of these conditions may change and we’ve found it far easier to deliver an informative and educational experience which will prepare you for future aurora photography, on a cloudy night than to explain to you that you missed your once in a lifetime opportunity to see Aurora when the clouds cleared at 1am because we canceled at 9pm. Furthermore, while solid overcast does inhibit the ability to see the Northern Lights, anything less than solid clouds still allows the Aurora to be viewed. Therefore to give you the best opportunity possible we still go out and have a good time and do our best to find clear skies. There are no refunds or exchanges for lack of Aurora sightings as this is nature and beyond our control. However, if you do not see Aurora with us, you may go standby any night we have open seats after 8pm for up to 30 days after your initial tour. We suggest traveler’s insurance for any other issues that may arise such as illness and other circumstances that prohibit travel on your part. Travelex has some great coverage options available.